Trying to find the best yoga studio to suit your needs can be overwhelming process. In the last few years I've practice, trained and taught in many studios in Burlington, Oakville, Milton and Toronto. Between where I lived in Burlington and where I worked in Toronto, I estimated that there are as almost as many studios out there as there are McDonald’s. Ok maybe that's an exaggeration but there seems to be one at every major intersection. So how did I find a yoga studio that best suited my needs? STOP!!!! Before you join or sign any sort of contract! What initially attracted me to join my first yoga studio is that my first class for free. I know some studios even offer an unlimited week of yoga for the price of a single class. I believe if the product is that good, it will sell itself. I found this really great deal call Passport to Prana, which is offered in major cities in the United States and Canada. In the Toronto area, for example, you can purchase a card for $30 and it entitles you one free yoga session at all participating yoga studios (I think there are at least 50). There are tons to choose from and you have about a year to use it (depending when you first buy it). Check out the Passport to Prana link for more information. Secondly, before you sign up for a membership or purchase a package find out the terms and conditions. Are you able to suspend it? Do the passes ever expire? How much notice do you have to give to cancel a monthly membership? You never know when life will throw you a curveball. I ended up needing to get my appendix removed so I had to take at least a month off from doing anything involving my abdominals. That yoga studio was great because they suspended my membership indefinitely and even honoured my old rate (the monthly membership cost went up while I was off). Why is yoga so expensive? I’m frugal- I would never pay $50 a month for a gym membership but I never second guessed paying over $100 for yoga. I love practicing yoga and go I there at least 3 to 4 times a week. It's much cheaper than a single drop in rate. If you are going 3 times a week and paying $100 a month, it’s really only about $8 a class. 3 times a week x 4 weeks a month (approximately) / $100 membership cost. That’s a deal. Most yoga classes are about 75 minutes long so it’s approximately $6.40 per hour. In Ontario, minimum wage is currently $10.25 so yoga isn’t really that expensive if you think about it. Another reason why I got a monthly membership verses pay as you go is because I hate wasting money!!! I'm too frugal to let it waste away without using it. Not everyone is like this. Some people can sign up for gym membership and not go for months. I on the other hand feel the pressure to use my yoga membership each month. As I previously mentioned my goal is to attend at least three classes a week. The going rate for drop-in classes is anywhere between $15-$20 a class. The best way to ensure that you use your membership depends on its location and accessbility . My yoga studio is located about a 5-10 drive away from my house so it’s quick and easy to get there. 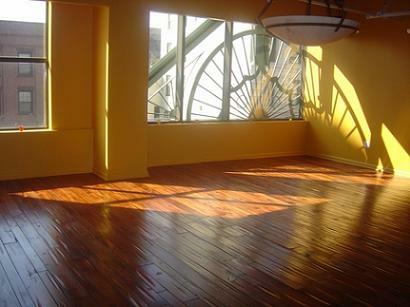 Joining a studio close to your home or work would probably be the best suited option for most people. An even smarter goal would be to choose a yoga studio that you drove by all the time. That way there would be no excuse of it being out of your way and maybe the guilty would haunt you as you passed by. Does the schedule meet your needs? Some Like It Hot offers two evening classes on most nights and weekend and holiday classes. I prefer this because I have a hard to committing to “every Tuesday at 6pm” since my schedule changes week after week. The last thing you want to do is to sign up at a place that doesn’t have a lot of classes offered when it’s best suited to you. 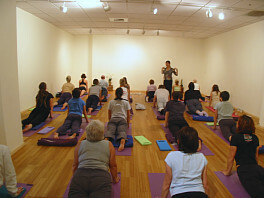 Does the studio offer a variety of different types of yoga classes? Although I belong to a hot yoga studio there are still different types of classes to take. There are power flow class, vinyasa and yin. Yin is a relaxing yoga that is all about restorative poses, whereas power flow yoga is about building endurance and strength. I often refer to power flow yoga as cardio yoga for that reason. Having more variety prevents boredom! Last but certainly not least, another thing I love about my yoga studio that keeps me going back is the community environment. Everyone that goes there seems to have a really great positive energy and upbeat attitude. I feed off of other people’s positive energy and have established relationships with people that attend on a regular basis. The teachers there are very friendly and approachable. They take the time to get to know the members and spend time chatting before and after class. This helps them to customize there classes to the individuals that attend. Finally, the yoga studio I attend isn’t anything fancy but it works for me. I have attended classes at another wonderful studio in Oakville that has a cork floor and a beautiful waterfall in the room, plus many other perks. It would be wonderful to practice there, however, the location isn’t convenient and the membership fees are more than I want to pay. Bottom line, you have to figure out what works best for you- price, location, schedule and environment. This will increase the probability that you’ll actually use your yoga studio membership! Click here to learn more about yoga!